If you took the SHRM pathway in 2015 to obtain your new SHRM certification, your recertification date is in 2018. However, if you have your required 60 PDCs already, early recertification will put needed money into the coffers of both your chapter and state council. 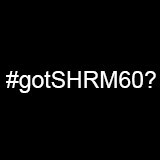 SHRM will give $20 to the member’s chapter and $10 to the member’s state council for each member who recertifies in 2017. It’s free money SHRM is giving to support your local and state SHRM! This incentive program not only benefits local and state SHRM entities, but also helps you because your new certification date will still remain 2021, and if it turns out any of your submitted activities were not credited, you have all of 2018 to resubmit. If you are eligible for early recertification, we ask that you do so. You are eligible to recertify early if you have acquired 60 PDCs and are at least one year into your recertification cycle. Monies attributable to at-large members’ early recertification benefit their state councils. As a result of this and many other instances of Toby enforcing company policies (and commonsense) thereby thwarting pandemonium, Michael finds no value in anything Toby says or does. Michael’s frequent inappropriate behaviors may seem farfetched, but if you’ve worked in HR, they are tame. Michael represents a collection of leaders who lack sound judgment, the ability to read basic social cues, and appreciation for the value HR can bring to an organization. So how do HR professionals earn respect and avoid being treated like Toby? In the HR world, we incessantly preach the need to “be strategic,” “get a seat at the table,” and “be part of the C-Suite.” These catchphrases, while important, don’t have the same impact they once did. We should really be assessing the threats that affect our organizations and HR departments. If we did, we would be in a position to create preemptive plans that both overcome the hazards and demonstrate the competitive advantages HR provides. To identify these potential threats, prioritize their impact, and develop a game plan to compete, I rely on the classic book Competitive Strategy: Techniques for Analyzing Industries and Competitors. In it, economist Michael Porter presents a framework to determine the competitive intensity and profitability of a market. Called the Five Forces Analysis, this strategy model is widely utilized amongst business leaders. It is time for HR to use it, as well. The threat of substitute products. When an alternative product or service is available, there is a greater chance of people switching. The threat of the entry of new competitors. This involves entities who have not previously competed with you. It can be brand new competition or an existing one that begins to compete through a shift in business strategy. The intensity of competitive rivalry. Different opponets use differnet tactics. Aggressiveness, available resources, the number of competitors, and economies of scale should all be considered. The bargaining power of customers. Such factors as the degree of dependency on you and your services, the uniqueness of your offerings, and the availability of substitute products determine customers’ ability to haggle. The bargaining power of suppliers. Like customers, suppliers and vendors can affect the intensity of competition through their ability to control prices and the quality of services they supply. One you understand each Force, it is time to identify the threats and bargaining powers that surround you. 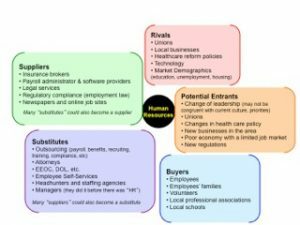 For HR, we tend not to think in terms of competing outside forces, but not acknowledging them does not mean they do not exist. The chart below shows many of the parties that are actively competing with you whether you like it or not. Our HR idol Toby accepted his low-level role; he took the abuse and reciprocated with minimal effort. I, however, prefer to think of Toby as a cautionary tale, a symbol of what not to be. Let’s win over the Michael Scotts and truly be strategic. 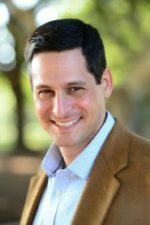 BIO: David Kahn, Ph.D. is a Leadership Strategist and author of “Case, Spandex, Briefcase: Leadership Lessons from Superheroes.” Additional writings can be found on leadersayswhat.com. Hurricane Matthew was a nice reminder that life in the Sunshine State isn’t always predictable. Prior to Matthew, it had been a while since we had to prepare for and recover from a hurricane. Quite frankly, this native Floridian enjoyed the break. If I don’t see another wing nut again, it will be too soon. I digress…the point is Hurricane season just began and this is a great time to revisit your emergency policies! I know, probably not worthy of the exclamation point. But, quite a few folks found some “holes” in their existing policies last October. The day before Hurricane Matthew hit our community, most people were thinking about plywood, water, shutters and canned goods–yes, that includes adult beverages. But, many HR professionals found themselves scrambling to respond to questions about payroll that had not been raised in over ten (10) years. Employers are not required to pay non-exempt employees for time not worked during a storm event even where the business is closed due to the storm. If your company chooses to pay non-exempt employees for hours they would have normally have been scheduled to work during the storm event, the FLSA does not require that you count those hours toward any overtime hours. The policy should address how many business days, calendar days, or shifts the company is willing to pay for non-worked time during an emergency. Confusion can arise if the policy simply states that it will pay employees “during hurricane closure” or during the “declared emergency.” Remember our friend Andrew? Some companies were closed for weeks. The policy should specifically define what triggers payment and when it ends. The maximum time frame or number of hours will come in handy during any longer-term emergency situation. As you know, exempt employees must be paid on a salary basis for each work week without regard to the quality or quantity of work. While there are limited permissible deductions that may be made, do not assume you can dock an exempt employee’s pay during a storm event. The DOL issued an opinion in 2005 advising that if a business is closed due to a storm event for less than a full work week, the employer must still pay the exempt employee the full salary for that work week. The employer may, however, require that the employee substitute vacation leave or other paid leaves during the time the employer’s facility is closed. But, if the employee has exhausted the paid leave bank and they are out for less than a full work week, you must pay the full salary for that workweek. Where a storm event closes a business for an entire work week and the exempt employee does not perform any work during that work week, the business is not required to pay the exempt employee. It is a challenge to ensure exempt employees do not perform any work with the proliferation of “smart” devices. Even during a storm event where power may be lost and some cell phone towers may be down or inoperable, it would behoove you to address whether nonessential exempt employees are permitted to perform work during the storm event and require them to report any time worked. Employee’s covered by Collective Bargaining Agreements. Well, you can forget just about everything above this paragraph. If you have employees covered by a Collective Bargaining Agreement, you must abide by the agreement. Many agreements will provide that the terms of the agreement are waived during a declared emergency except, of course, the financial provisions relating to wage rates, overtime, etc. With that said, read your union contract. I cannot stress this enough. In fact, I suggest you do this now to ensure you know what the emergency provisions are and how the overtime, call back or standby pay provisions might come into play during these storm events. If this is not addressed in the agreement, or not addressed sufficiently, you may want to put this on your list of items to address at your next bargaining session. Even though we don’t know when Mother Nature will give us another good scare, filling the gaps in your current policy (or collective bargaining agreement) will give you a jump-start on the next event. Once you’ve got that done, pat yourself on the back, kick your feet up, and pop open one of those “canned goods” you stocked up on while preparing your hurricane kit for this season. 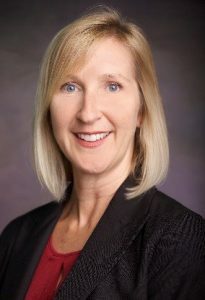 Lara Donlon, Esq., SPHR, SHRM-SCP, is a shareholder with Torcivia, Donlon, Goddeau & Ansay, P.A. 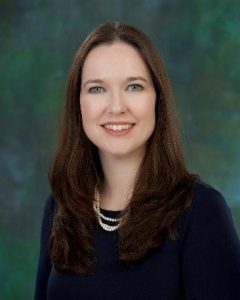 She leads the firm’s Labor and Employment Law Group and focuses her practice on representing private and governmental clients with respect to human resources matters including litigation and general counseling. Ms. Donlon will be presenting The LGBTQ Workplace—Ensure Compliance, Expect Tolerance, Strive for Acceptance at the HR Florida Conference—register now at hrflorida.org! You notice that an employee is having trouble at work. Maybe that person is taking many unexplained breaks and calling in sick to work frequently. They seem distracted, forgetful, and worried. As an HR professional, you know that something is going on that will start to impact the employees work performance, if it hasn’t already. But what can you do to help the employee? Every year 1 in 5 Americans experiences a mental illness; these are our co-workers, employees, and friends. May is National Mental Health Awareness Month and HR Florida is partnering with the National Alliance on Mental Illness (NAMI) Florida to bring awareness to the impact of mental health issues in the workplace and how organizations can work towards having a stigma free workplace. Stigma Free Florida is a campaign designed to change attitudes within workplaces regarding mental health and individuals with mental illness. With the help of human resources professionals and business leaders around the state, we can make a difference for those with mental illness and create more inclusive and supportive workplaces. Changing the stigma around mental illness requires thinking about mental illness no differently than other illnesses such as diabetes or heart disease. Science has shown that mental illnesses are treatable. Early intervention is critical to improved recovery time; however, many individuals are afraid to seek treatment for fear of being stigmatized, labeled, and potentially shunned. Since most Americans have health insurance coverage through their employers, ensuring that employees have adequate mental health coverage and are aware of their benefits can encourage more employees with mental illness to seek treatment; access to treatment and recovery supports that have proven effective can speed the individual’s recovery and minimize any harmful symptoms. Having an Employee Assistance Program (EAP) is another benefit that can help employees who need assistance dealing with their own mental health, or the mental health issues of a loved one. Personal Leadership: Educate organization leaders and managers in understanding mental illness and best practices in the workplace. Communication: Communicate to employees the important of recognizing mental health challenges in the workplace, encourage employees to withhold judgement against individuals struggling with a mental illness, and express the need to move beyond the stigma. Information: Partner with NAMI Florida or one of its affiliates to provide educational information to employees or bring a presentation such as NAMI’s “In Our Own Voice” into the workplace to further understanding and empathy about mental illness. Stigma Free Workplace: Encourage open dialogue among employees about mental illness, starting by distributing and posting educational materials for employees and managers. Health Benefits: Examine employee health and wellness initiatives to ensure availability of effective benefits for mental illness and addiction. Employee Assistance: Strongly consider an Employee Assistance Program (EAP) or ensure the existing program is welcoming to all with mental health issues and effective in providing assistance to them. Public Awareness: Participate with NAMI Florida through linked websites and media awareness in educating the public about how to move beyond stigma, where possible. Mental illness is the single greatest cause of worker disability in America, impacting productivity, absenteeism, presenteeism, and worker safety. HR professionals and business leaders can make a huge impact in their organization and the health of the workers by reducing stigma associated with mental illness and ensuring health benefits and employee assistance programs provide appropriate coverage. Join HR Florida in supporting Stigma Free Florida! Eve Sweeting is the Diversity Director for HR Florida. With over a decade of HR experience in private, public, and non-profit entities, Eve currently serves as an HR Analyst with a focus in performance management and workforce metrics. She believes that HR’s ability to impact the work environment for the better can benefit both workers and organizations. It’s the beginning of a new year but for many, January seems like the “winter doldrums.” After the excitement and energy of the holiday season, energy level and productivity of workers often decline in January. This is very bad news, especially since a survey of the American labor indicated that only 12-15% of American workers are giving their best to their jobs at any time and that the average American worker only makes 2.7 work-related suggestions a year. It is clear that employers must do something to jumpstart creativity. A good idea is an “idea generation” campaign whereby staff is encouraged and rewarded for offering innovative solutions. Businesses that enact such campaigns report up to a 70% improvement in quality and also in employee morale, which is understandable in that employees routinely say that having management listen more to their ideas is a good way to keep them happy. Idea generation campaigns must begin with employers taking a realistic look at their current policies. Many company procedures actually discourage innovative thinking by putting in place so much committee or cross-departmental red tape that employees are discouraged to speak. The reason for such procedures is often a desire to keep costly mistakes at a minimum, but the fact is that in today’s competitive environment, most productivity gains resulting from incremental change are not going to the profit bottom line of the business but to customer cost savings. This means that only large productivity gains engendered by dramatic changes will prove of major impact to the business, so employees should be encouraged to make drastic suggestions. Businesses can consider awarding Giraffe awards, recognizing those who “stick their neck out” with new ideas, even if those ideas did not prove ultimately successful. Also, post problems on a bulletin board and encourage staff to write suggestions for solving the issues on post-it notes and attach them to the board. Give prizes for worthwhile ideas not only to the person who had the idea but also to his or her supervisor, to encourage the manager to create an environment of idea-generation. Encourage employees to give suggestions across departments by facilitating a “Not Invented Here” award. Another thought would be to a have a one-idea-for-improvement contest conducted company-wide for one month and see how much energy is generated. It takes a concerted effort on the part of employers to stir the creative juices of their employees, but the return on that time investment can be very great!